OUR PRICE: $16.15 - Join Rewards Get $1 Dance Dollars On This Item! 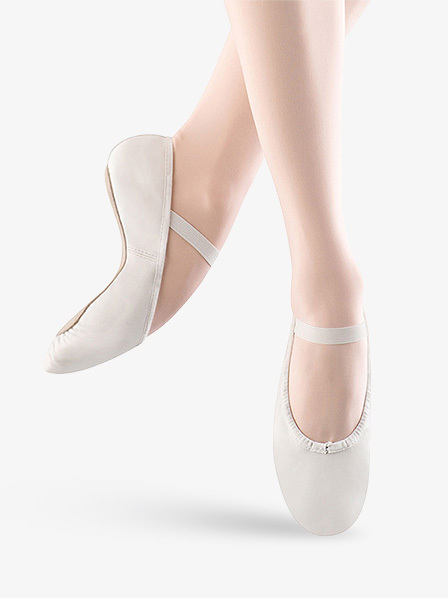 Bloch's "Dansoft" is an ideal student ballet shoe with the elastic already attached and a full suede sole. It has a strong but flexible leather upper and a cotton lining. Attached single elastic. First increase the child street shoe size by two. Then follow the suggested fitting for the adult shoe you are purchasing. I was hesitant to order this without having it fitted first, but I ordered the correct size (6.5B) for my little girl. Her feet is slightly on the narrower side. I sized up by half a size from her street shoes, and they fit perfectly with very little room for growth. If I had ordered a whole size up, it would’ve been too big. My students try on their slippers before the first class. Generally, the size is the same as the athletic shoe. Girls with a long first toe usually need to go up a half size to allow for growth during the academic year. Girls with a chunky foot sometimes need a C width. When going to a C width rather than a B, the same numeric sized shoe runs slightly shorter in the C width. This year, I had only one student out of 100 need an A width. A is narrow. As students get into junior high and high school, many choose the C width. This brand of shoe is all leather. Even the insole is suede leather. I wash my own slippers in the washing machine about once every 6 weeks. Put the shoes in a warm place to dry. Do not put them in a dryer. Usually, I use liquid detergent on the inside and outside. I wipe off the soap and dirt with a paper towel and then toss the shoe in with the dark clothes right into the washer. Bought these for my 2.5 year old. She wears a size 6. I bought a 7D based on reviews. Her foot was a whole inch longer and way too wide to fit into them. Returning and buying an 8E. Here’s to hoping the next size and widest shoe will fit! My son started out in ABT shoes from Payless because I put off buying shoes until the last minute and then when I had time to buy shoes the dance store was closed, and my stepson was dancing at the time, so I ended up with a 1 and a 1.5 in ABT shoes. I was surprised, then, since this web site says to order street size, because when I finally went to the dance store to have him fit in Blochs (since they're cheaper than the ABT shoes, and nicer) that he was in a size 1 with room to grow. He was going into size 2 shoes at the time. So for my son I order a full size smaller than his street shoes. I love these shoes, but will probably end up switching to a canvas split sole soon, as he is getting older and his feet are getting stronger. I bought these and they are actually too big but they are of good quality so I'm purchasing the next size down and will keep these on hand for the next go round! Thanks Discount Dance! Great pricing, great service and great quality! We needed to get white ballet shoes for the nutcracker. All of the local stores only had the Capezio brand, which ran small in length but horribly wide (even in narrow). 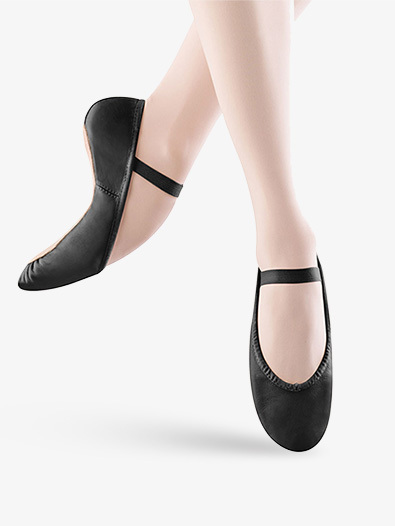 She uses bloch in the b width for ballet class, and these fit just like her pink ones... perfectly. She's now ready to perform! These fit her true to size and they are soft leather - very comfortable. I am glad we went with these - they are perfect. I would recommend. These are the exact same ballet shoes (Bloch) I bought from a local store and paid more for. They fit perfectly but I did order ~ .5 size larger. I used the chat option to speak with a representative about these ballet shoes. They are beautiful, well made and very comfortable. I bought two pairs for my girls who are both in ballet (ages 6 & 8). I followed the manufacturer's suggestion to buy them a half size larger (10.5 and 1.5) than my daughters regular street size in shoes (size 10 and 1). They are too big by about an inch/thumb size. I am hoping that they will grow in to them. I also asked what "B, C, D, E" meant next to size when you order. That refers to width. B is the narrowest. I ordered C for my girls which is fine once the shoes were tightened but otherwise would have been too wide. My girls wear regular width in their street shoes not narrow or wide. Played it safe and ordered shoe 1/2 size larger than street shoe, honestly we would have been fine if we went with just street shoe size. My grade school daughter puts some serious wear & tear on slippers, Bloch never disappoints. We went to our local dance store, but they didn't have my daughter's size in stock so we ordered online. The shoes arrived quickly in excellent condition. The sizing has been close to street size (possibly slightly bigger but once the front ties are tightened it's perfect). Very happy with them. This is the 2nd pair of Dansoft ballet slippers we have owned. I bought the first pair a year ago, and purchased this pair because my daughter is a bigger size. I am really happy with these ballet slippers, there is practically no wear showing on the smaller slippers (also Bloch "Dansoft"), even though they were worn for almost a year. I will stick with Bloch because they are a great value. I know I will get at least 2 girls (if not 3!) to wear them for a full year of dance class! Very nice quality and product; however, my 7 year old's foot grew more than I realized, so the shoes fit too snug. Had to return, but would have kept if sizing worked (again, my own fault). I bought my 3 year old her first pair from a dance store so that I knew her size but after that I have bought her the next size up and they fit perfect. I think the quality in Bloch is great. I would buy again. Bloch ballet shoes at fantastic prices. Shipped as expected. Great shoe - and great service! I ordered from Discount Dance after my local ballet store told me they were out of stock of this particular size and couldn't get it in for another 2 months. I ended up getting my shoe in 2 days, and for the same price I would've paid at the store! (after paying for the priority processing!) Very happy with the service. . .
After reading the other reviews that you should order a size larger than your child's normal shoe size -- don't do it! They were way too big. I ended up sending it back and ordering her standard shoe size, which fits just perfect. My daughter started her first dance class and she was the only one who had "real" ballet slippers on at the first class. Everyone thought they were "cool." (hey they are 5) and I've given your website out to many people. Nice shoes but they run very small! After reading other reviews, I order a pair of these shoes for my 4-1/2 yr old daughter. I order a 10.5c because she currently takes a 10 in shoes and she has normal width feet. Well, she couldn't get them on entirely, they're way too small! I'm going to have to return them and guess on another size. I think an 11.5 would fit, so I'm ordering a 12c so she'll have a little room. Other than small sizing, I really liked the quality of the shoes. They are a soft leather with what appears to be a durable sole. They seems better than the previous two pairs of shoes she wore from other manufacturers. Great Shoes And Fast Shipping! I read a bunch of reviews about the sizing being off. I was a little worried but these fit my daughter perfectly. I ordered her street shoe size and they're fine. There's a 1/2" to 1/4" room at the toe, which is a lot if you're a grown up, but perfect for a five-year-old, and just starting ballet. I ordered a "B" width and they're a little snug. These are leather and very soft and will stretch when they're worn in. They'd be too loose if we ordered wider shoes. They're perfect! 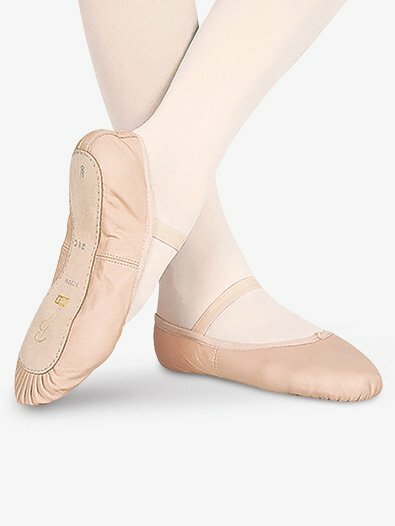 We've ordered Bloch shoes before for my older daughter (for years) so I know they last. Good shoes! I ordered these for my girls, and used your online recommendation of 1/2-1 size larger than their street shoes. Well, they arrived yesterday and they are WAY TOO SMALL. I had to go to a local shop to have them sized/fitted and we ended up getting a full size larger for one daughter, and 1.5 sizes larger for the other. Should reflect the recommendations accordingly. Now I have to pay to return them! too bad. If they were too big that would have been preferable to TOO SMALL. I don't know about durability, as we've had them less than 24 hours. This was a third pair of ballet shoes for my daughter and we both love it. They are soft and fit well. They are much softer and better fitting than the brand we had before. Next time I am buying Bloch again. These shoes are a great shoe for the beginning dancer. Order 1/2 smaller than street shoe for childrens sizes. My daughter wears a 13 street and the 12.5 fit with a 1/2 pinch extra in the toe. Again, very durable AND soft. These shoes are good for starters in ballet, but I wouldn't recommend them for serious dancers. I purchased these partly because of the reviews. They were all true! These shoes are true to size, and very comfortable according to my daughter. The price isn't bad either. You can't go wrong with these. Well worth the price, comfortable fit and true to size, will buy again!!! These shoes are great for just starting ballet but the strings keep on going back into the shoe and don't let you point your feet very easily. And after a while the soles start to harden up and can make you fall very easily. My younger sister had these shoes. She recently switched to split-sole, but when she had these she loved them. They last forever and help strengthen arches, preparing for pointe work. I myself wore these shoes when I was younger, and I recommend! This shoe has been used at my ballet school for the past 14 years by our 3yrs - pre-pointe level. The older girls like the split-sole kind but only if they are on pointe, can they switch. It's nice looking, forms to point of foot, it helps them strengthen their feet, it holds up, and a great price. Ballerinas stick the drawstring in so no worries about shoes coming untied. My daughter had her first pair last year and we made it all year in the same shoe. We just bought a 1/2 size bigger for this season. If your child has a very wide foot, you can get D and E width from your local dance store. Very sturdy, good shoe for young dancers. The leather is thicker than Capezio's and better quality overall. Until my daughter is ready for split sole, these are great shoes for her. Used Them For More Than 3 Years! I own a pair right now, but decided to buy a new one since my old ones are wearing out. They lasted since last summer and I'm still using them today! I personally think these shoes work out for me. They are comfortable and I really think these shoes are awesome because leather and full sole shoes seem hard to get these days. I really do recommend Bloch's "Dansoft" shoes! We've just purchased our third pair of these shoes, so I guess my 3-year-old likes them! They are soft leather, and very durable. My daughter insists on wearing them as street shoes EVERY DAY, and they hold up until she outgrows them. The reasonable price makes buying three pair in one year more bearable as well. My only complaint about these (and my reason for only giving 4 stars) is that I am constantly having to tie these for her - - the elasticized ties come undone constantly, no matter how many knots I put in them. Still - I recommend them! My 8 year old daughter wears shoe size 3. What size of ballet shoes do I need to order for her? 1. Not sure what is asking for Size ofA,B,C,D,etc. Child "Star Split" Canvas Split-Sole Ballet Shoes??? 2. For Child Economy Leather Full Sole Ballet Shoes. How big is Child 1.5? Will that fit my daughter? very confused about what size to order. Thanks. For a size 3 you will need to convert to an adult shoe. S0205L would be the adult equivalent of this shoe. Please follow the chart for converting to adult size and then you can follow the manufacturer recommended sizing which is 2 1/2 to 3 sizes smaller than street size. A, B, C, D indicate the width. A is most narrow, C is "average", and D is wide. Sign in before answering this dancer's questions. My daughter wears a 9 toddler size, so I'm confused with how to convert and choose the right size for her first ballet shoes. Please help. As a toddler size 9.0 you would actually not need to do the shoe conversion. That is for children that are growing out of the child sizes and are needing to switch into the adult equivalents. The recommended fit for the child size is to order either the same or 1/2 size larger than street shoe. This would mean that for your child the recommended fit would be a 9.0 or 9.5. My daughter wears a kids 3.5 shoe. If I convert this to an adult shoe, then I have an adult 5.5. Am I supposed to then subtract 2 or 3 sizes from that, bringing me back to the 3.5 or even a 3? I'm sorry, but I thought I understood this until I started seeing other Q&A. Thank you for your help. You are very close! First you would convert her 3.5 to an adult 5.5 and you would want to be looking at style #S0205L (the adult version), not the #S0205G. You would then want to subtract 2.5-3 sizes leaving you with either an adult 2.5 or 3.0. What does the A, B, C, D mean? My child is 7 y/o and size 2.5, what is her estimated size in adult? My daughter is a little taller than average age for 7 y/o therefore her feet needs one size bigger and she will be 8 in April with a growth spurt. I am new to this site but need help. If she is a street size 2.5 child than she would be a 4.5 in adult. The adult version of this shoe would be style S0205L and the sizing guide states to order 2.5-3 sizes smaller. So in this case I would sugeest ordering a size 2.0 adult(2.5 sizes smaller than her street adult size 4.5) and the A, B, C and D are the width of shoe. A- Extra narrow B- Narrow C- Medium D- Wide width If you need further assistance please feel free to contact customer service. My daughter is a children's size 2. According to the sizing guide I should order a Child 2.5. That is not an option. When I go to the adult sized shoe and do the conversion I once again find myself in a size that is not covered. What are my options? Suggestion would be to order the size 2.0 in the adult shoe.